Drain and press tofu. Cut it into cubes and deep fry until it’s golden brown (about 5-6 minutes). I use corn oil in a Fry Daddy, but you can also do it in a few inches of oil heated to 350 degrees in a frying pan. Be careful not to cook it for too long, or else it will be tough. I rinse mine with hot water and drain it on paper towels to cut down on the fat content. In a small bowl, whisk together the cornstarch, sugar, garlic, water, soy sauce, vinegar, white wine, and veggie stock. Set it aside. Add a bit of oil (vegetable, canola, or corn) to a wok and heat over medium-high heat. Add the scallions, ginger, and peppers. Saute for a minute or so, then give the sauce a good stir and add it to the wok. 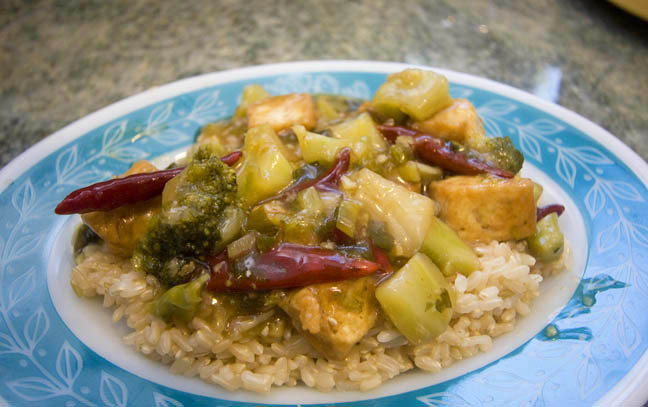 Cook it until the the sauce becomes thick and clear, then add the tofu and broccoli and cook until it’s heated through. I like to serve this over brown rice. If you prefer crispy tofu, you can dip it in egg or egg substitute, then coat it with cornstarch before frying. Yummo! Thanks, I will certainly have to try this but with chicken. This was a great meal and my family is still talking about it a week later!